Gasyfying boilers ZEUS PYRO are ecological heatings boilers controlled with modern electronic regulator with microprocessor, that verifies all requests on unassuming attendance and high comfort, as well as control of whole central heating systems and heating of sanitary warm water. The secure boiler running is secured with 2 emergency thermostats and with integrated security heat exchanger against overheating, what is the main condition for installing the boilers in heating systems with circulating pump. Boilers ZEUS PYRO are classified according EN 303-5 in the class 4. Construction of ceramic combustion chamber in rear part and fuel feed in front part of boiler ZEUS PYRO protect the boiler against flue condensation, what increase its lifetime and simplifies its cleaning and maintenance. The wood firing runs by high temperatures on the principle of gasyfying. The boiler body is manufactured of a high-quality steel plate with the thikness of 5mm(plates which are in touch with fire and water) and 3mm(plates which are in touch only with water). A part of the water circly are also 2 water lamellas in the upper part of boiler body. The insulation cover is made from steel plate with the thikness of 0,8mm, covered with a pulver colour. The thermal insulation is built with with mineral cotton. The primary air into the boiler is supplied through the flap in the front of the boiler. After that the air is devided into 2 parts. One part is going up and through the wood to the jet, the second is going down through the glow wood to the jet. The secondary air is supplied directly into the heating chamber from the bottom rear part of the boiler through opens in the ceramic block. All air supplies are regulated. In the bottom part of the feeding place are ceramic blocks and massive cast iron grate. The segmented ceramic heating chamber is in the rear part of the boiler and reaches up to the water lamellas. 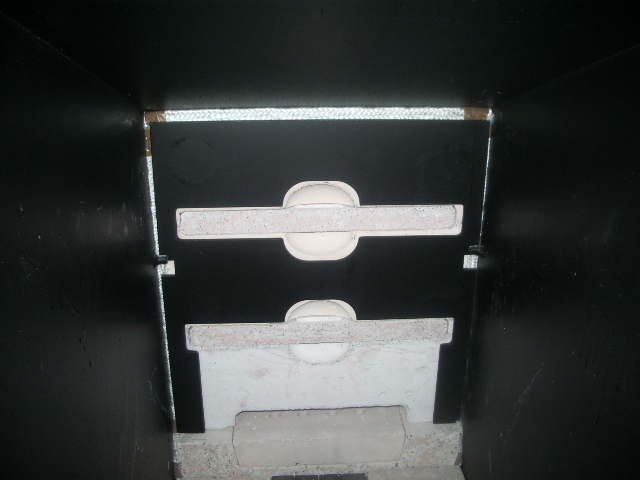 The haeting chamber is made from firebeton(ceramic) LACFIRE 1800/20 SiC with high temperature and mechanical resistance. The heating chamber is moreover protected with perforated steel plate. The heating chamber is very easy to clean by removing of the some parts of the blocks. Modern technical solution of the boiler body and heating space insure perfect firing with high efficiency and low creation of ill substance in the emmisions. On the bottom of the feeding space are massive cast iron grates, where the ash falls down to the ashtray. The ashtray is in a separate part of the boiler. This construction allows to achieve very high temperature in the heating chamber and long time to hold emmisions in the boiler for its completly firing. In the boiler is integrated a cupper security exchanger against overheating. 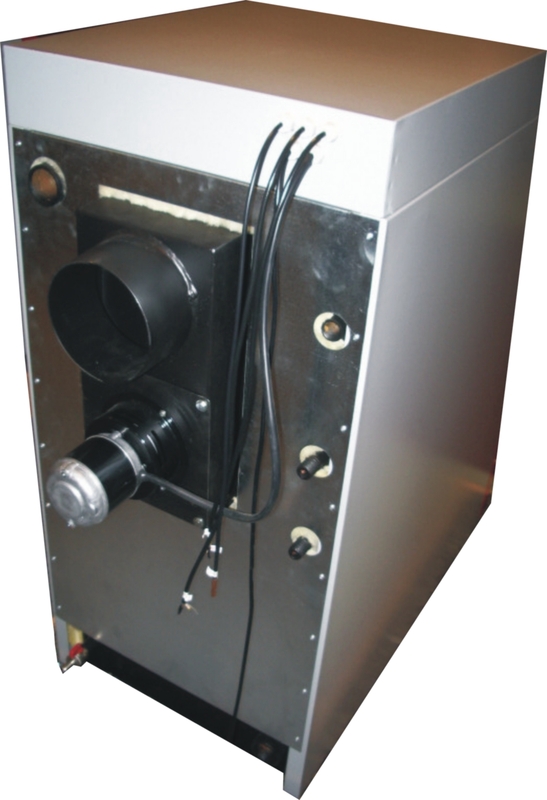 The boiler is equipped with exhaust fan, what minimalizes smudging by fuel feeding. Boiler is controlled with by mikroproccesor regulator.